Locks Gallery’s exhibition includes a cross-section of the “obsessional” three-year series. 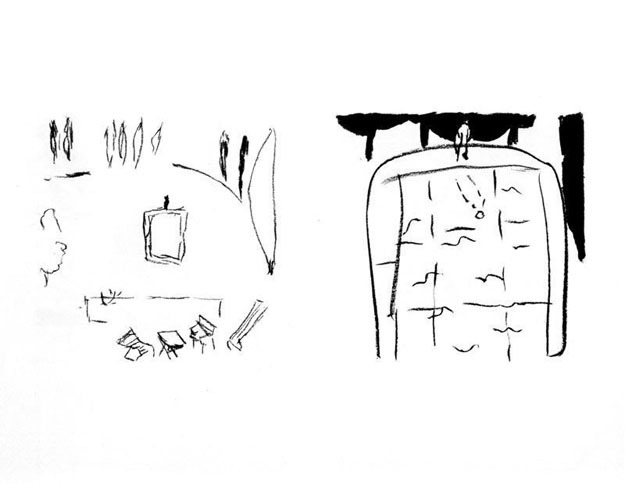 In addition to the suite of drawings, Bartlett’s In the Garden project had several additional stages, (detailed in Locks Gallery’s well-researched catalog) all of which are represented in the exhibition— her three sets of 7 paintings in a range of mediums, based on specific drawings; her prints of the same imagery; and her final paintings on canvas of the Nice scene, made from photographs Bartlett took while on-site. The one-room installation opens at the beginning—with In the Garden #1, 1980, a graphite take on the backyard scene, and one of 10 early works on paper in the exhibition. 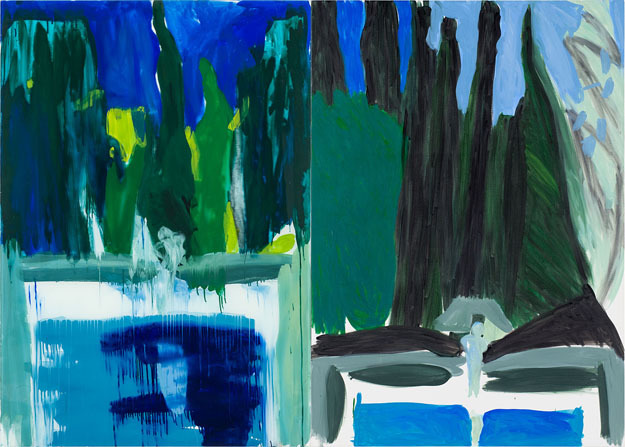 From there, the selection favors Bartlett’s cinematic late diptychs and triptychs, including Pool, Dog and Cat, and Night, all painted in 1983. The layout of the installation makes it difficult to trace In the Garden’s chronology, as it skips from her earliest works on paper to her last paintings in the series, and then back to her mid-series works on multiple media from 1982, finally ending with more drawings and watercolors. Bringing all of these pieces together does, however, allow several of Bartlett’s successes surrounding this series to come to light. In the Garden has been characterized as the period where Bartlett taught herself to draw, but it could be more accurately defined as Bartlett’s mediation on place, its vagaries, and all the opportunities they afforded her. The iconic, square-and-triangle house motif was central to some of Bartlett’s earliest work, but with In the Garden, every detail of the backyard held potential, and was explored accordingly. Her intentions become particularly clear upon reading the notes she wrote to herself around the margins of In the Garden, 1980—her interest in capturing precise measurements of scale, perspective, hue, and time of day. In one of the earliest works on paper, In the Garden #17, 1980, Bartlett cuts from a birds-eye view of the entire backyard to a flattened, cropped view of the pool, the sculptures, and the trunks of the trees behind it, all roughly captured with a piece of charcoal. The work, however, is still strikingly observant—in the close-up, Bartlett notes where the sculpture’s shadow falls over the water, and how the cypresses appear to close in on the figure as the cropping becomes tighter. One of the joys of the exhibition is watching this kind of conscious, early experiment evolve into paintings like Pool, where Bartlett precisely scales the sculpture relative to gradually-steepened perspective. The painting captures the trajectory of the mid-morning light in all its nuances, as it illuminates a swath of cypresses or spills westward over the edge of the basin and transforms the water into a riot of abstract color. 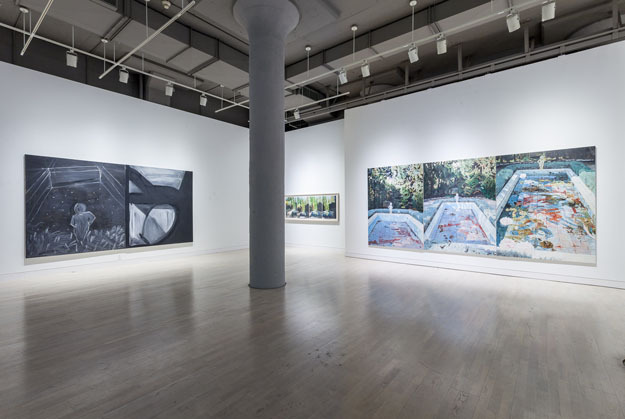 Even after In the Garden, Bartlett would continue to paint these precise constructions of time and place, particularly with her Air: 24 Hours paintings, each showing a new scene in her household at a different hour of the day, and in her more recent diptychs of details from her backyard garden in Brooklyn. In the Garden is also a rare opportunity to explore both Bartlett’s mastery of multiple mediums and her willingness to embrace chance in her use of materials. 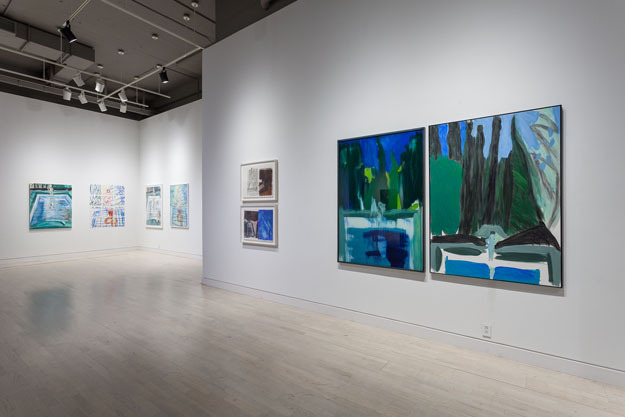 Calvin Tomkins noted in a 1990 essay on Bartlett that while she executed her Swimmers series in the late 1970s, completed not long before In the Garden, she was obsessed with precisely matching the color and texture of her brushstrokes on canvas to those on her signature enameled steel plates. This tight control over medium is evident in the masterful In the Garden II, 1980, a four-piece representation of the pool and boy, in oil on canvas, enamel on steel plates, pastel on paper, and enamel on glass. The two works in enamel are overt tributes to Matisse, with their curved lines and palettes of pinks, yellows, and blues, while the representations in oil paint and pastel provide a modeled, three-dimensional take on the scene. Her two works in enamel are nearly line-by-line twins, and seemingly every brushstroke in oil paint is replicated in pastel. Bartlett encourages the viewer to recombine these pairs visually with her use of color. The two works on the left, in oil paint and enamel on steel plate, are darker in tone, with blues that suggest a cloudy day, while the other two pieces present the same image with more washed-out hues of blue and yellow, suggesting direct sunlight. With In the Garden III, #5, 1982, however, a diptych painted in enamel on glass on the left and oil on canvas on the right, Bartlett accepts the viscosity of the enamel, which drips and runs in streams down the surface of the glass; the statue of the boy seemingly melts into the water below him. In a stark contrast she then pairs the left half with a strictly modeled oil painting, where she precisely delineates the cypresses with vertical strokes of black paint; the layered blues of the sky seem reluctant to touch the trees, leaving thin haloes of bare canvas. Bartlett takes note of several of the same details in both halves—the way the water darkens closer to the boy, where his pale shadow falls over the pool, the hints of blue in the cluster of trees on the left—but presents the scene as the sum of both renditions, a concession to the impossibility of any single, perfect representation. Jennifer Bartlett is a daunting artist to display—her prolific practice and the recursive, self-referential character of her series make her work nearly impossible to summarize. In attempting to capture her full career of experimentation, spanning canvas and steel plates, representational painting and conceptual abstraction, (not to mention her printmaking, collages, and multimedia commissions) it is easy to lose sight of how Bartlett has covered immense distance through a lifetime of infinitesimal steps. In taking the time to focus on such a short, fruitful period of her career, Jennifer Bartlett: In the Garden compellingly demonstrates the importance of Bartlett’s more subtle experiments in medium, perspective, and juxtaposition. Kerry Bickford holds a BA in Art History and English from Northwestern University. She currently works for the Pennsylvania Academy of the Fine Arts.